I titled this post Unnecessary Necessities, which is totally an oxymoron, but by baby #3 there really aren't any products that I need need. However there are a lot of products that I want want. So they are pretty much necessities but not necessarily necessary. Are you following? Plus it's just nice to get the new baby a few new things. I've had several people email me and ask if I've done a post on my favorite baby items, which I'm sure I did at some point with Eli, but I think it's time to make an updated list. So I will post that soon. I recently asked people on my FB and Instagram what their favorite baby products were so I will share those as well. I think there are no better recommendations than from those who are in the thick of these baby years using all these products. It's interesting to hear what products people can't live without. If you follow me on instagram you know that I became a little obsessed with finding THE perfect diaper bag. I've had several diaper bags throughout the years and I felt I never found the diaper bag that I absolutely loved. And after two kids I've found out what I like and don't like and need and don't need. After a lot of research I'm pretty positive that the Lily Jade bags have everything I need. I really wanted a bag that didn't look like a diaper bag yet had all the functionality of a diaper bag, PLUS it could be worn numerous ways. With Annie I thought I wanted a bag that could be crossbody but I found when I'm babywearing that a crossbody bag just doesn't work, so I needed a bag that could be a backpack. A lot of the Lily Jade diaper bags can be worn on your shoulder, crossbody OR as a backpack. Perfect! I seriously think this is the perfect bag I've been searching for. I've posted before on here about babywearing and how I got much more into it with Annie than I did with Eli. I loved wearing Annie, and I wish I would have done it longer than I did. And I can only imagine that I will be wearing baby brother A LOT of the time as it just seems to make things easier. Plus I love having my baby close to me, I find it helps keep other people's hands and germy germs off of my them. Here is my blog post about the wraps/carriers I used with Annie. I've been doing research since then and wanted to try some other carriers, so this time around I know I want the Happy Baby Wrap the Wildbird Ring Sling and also a Tula. I don't plan on getting rid of any wraps/carrier I currently add so I will just add to my collection. I don't think you can have too many! I use them all for different purposes. I could have an addiction but I just love them all! 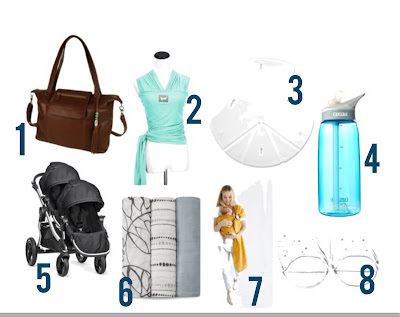 I put the puj tub on my list of baby gear that I wanted to get before Annie was born. I never got the tub, and I thought I was ok with it, but I wished I had it so much, so I'm determined to get it this time around. It's really the best tub, and I highly recommend everybody get one. How random is it to want a water bottle? But I lost my camelback water bottle and I need a new one. Those first few weeks, maybe even couple of months after having a baby I am SO THIRSTY all the time. Breastfeeding makes me SO thirsty so I always have a huge bottle full of water with me. This is a necessity. I wanted a double stroller when I had Annie but never got one. There were times it would have been nice to have one, but Eli was three when Annie was born so it wasn't always necessary for a double stroller. Annie is going to be two when baby brother is born and I asked the advice of several friends and decided it would be extremely nice to have a double stroller with the two year age difference. I've heard so many amazing things about this particular stroller and a friend sold it to me for a great price second hand - perfect! I am so excited to use it! OK, these are the best swaddles ever, BUT you have to make sure you get the ones made of rayon and not cotton. I found there is a BIG difference and the swaddles made with rayon are so much better. I use these for EVERYTHING. I definitely use them for swaddling, I use them as blankets to lay my baby on, I use them as burp rags and sometimes to cover myself while breastfeeding, they really are perfect. I obviously have some from Annie but they are all pink, so I needed to get some boy themed swaddles. 7. Wild Bird Sling - which I talked about with #2. I obviously love the Aden+Anais baby products and these bibs are no exception. They have a snap on them and they wrap all the way around the baby so they truly provide a lot of coverage. Plus you can unsnap them and use them over your shoulder as a burp cloth. They are so awesome. So those are all the new products that I've gotten or plan on getting for our new baby boy. I'm sure there will be others as the days go by.Do you have any unnecessary necessities? I would love to hear them! I can't remember exactly how I knew what size to go with, I think I just went with the sizing on their package. I have a small and it works grew t- I agree with jamie B, very true to size!